Over the last month or so, I’ve gotten really into swing dancing. It’s a new and exciting challenge for me—I’m not the most coordinated person, and dancing is a unique kind of social interaction. For the most part, this has taken me well out of my comfort zone. Luckily, as is often the case with learning new things, I’ve found ways to relate these new ideas to things I already know. In particular, I realized that if you reeeally squint, swing dancing looks kind of like a regular language. The dance that I’ve been learning is usually called East Coast Swing. It’s a really fun social dance that is set to quick swing music. The basic East Coast Swing step is a six-count pattern—depending on the tempo of the music, the pattern is either “rock step, triple step, triple step” or “rock step, step, step”. 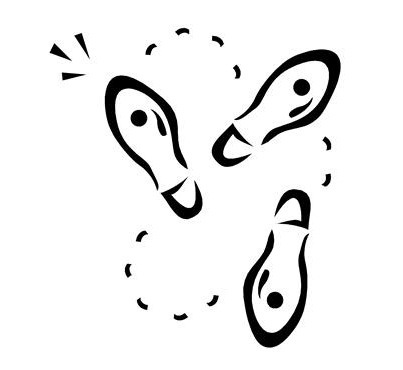 Often, dancers will also incorporate elements of Lindy Hop, a very closely related dance, which uses the eight-count pattern “rock step, triple step, step, step, triple step”. The latter is what’s happening in the gif above. Of course, there’s a lot more to dancing than footwork. In swing, partners dance in a number of different holds and positions, and there are also tons of different moves that make the dance fun and interesting. I highly recommend checking out some YouTube videos of people dancing to get an idea of what I mean. When I started learning different swing moves, I realized that each move was sort of a “transition” from one “state” to another. For example, the partners might be dancing in closed position and the lead might use a “tuck-turn” to transition to open position. More subtly, a left-side pass from open position might leave the couple back in open position, but with the leader’s hand on top of the follow’s hand (normal open position has the leader’s hands under the follow’s). As you can see, even with just a few moves and states, the diagram gets pretty complicated pretty quickly. Focusing in on a particular state often helps to clear things up; for example, looking at “closed”, we see that a basic step would keep the couple in closed position, and a tuck-turn would transition to open position. As we increase the complexity of the moves that we allow, there are a number of interesting things that we can add to the model. Here’s a slightly more complicated automaton that incorporates some 8-count “Lindy Hop” moves. The main thing to notice is that when I added 8-count moves, I added extra states. Strictly speaking, dancing 8-count moves doesn’t correspond to a different physical position, but it does correspond to a different mental position. When leading, it is important to be able to communicate your intent. Your partner needs to know that you want to start dancing 8-count patterns after a while of doing 6-count, and vice versa. Since my partners and I are usually beginners, I try to use a simple move (like a basic) to go between standard East Coast and Lindy. It should be clear that if we focus in on only the moves and positions, we can represent the space of East Coast Swing routines using a finite automaton. At any given point in the dance, all of the “valid” moves would be available as transitions, and other ones wouldn’t. It is a well known fact in computer science that every finite automaton corresponds to a (regular) language—formally some set of sequences of symbols (strings) that satisfies some property. In this case, the “symbols” are swing moves, and the property is that the whole sequence makes sense as a dance. This means that we literally have a “language” of swing dance, and it corresponds exactly to routines. because the lead’s hand would get all flipped around. When I lead a dance, I can keep a model like this in my head. Obviously, I’m not actually simulating the automaton in earnest, nor am I really thinking about strings and languages, but thinking about moves this way gives me a framework for deciding what to do next. If the “strings” that my partner and I dance are in the language of swing, I can be sure that the dance will feel natural. I have a lot of cool ideas for ways to use this language model of dance, and I’ll probably write another post exploring one or more of those options later. For now, I’ll just mention a couple of my ideas. The automata above are both (mostly) deterministic. This means that the current state completely determines the effect of a move. Put more simply, it means that there are no two arrows with the same label coming from the same source state. Technically speaking, labeling both “closed” and “closed, 8-count” as start states is a form of non-determinism, but this is resolved as soon as the dance starts, so it isn’t very interesting. A more interesting form of non-determinism is “-transitions”. An -transition is a transition that happens without a symbol being read, or, in this case, without a move being done. It turns out that these transitions don’t actually change the set of languages that automata can represent, but they do offer a compact and intuitive way to consider state changes that don’t depend on the input/moves. If I allowed myself to use -transitions, I could encode things like the music speeding up, or even something as silly as getting tired. In both of these cases, we might want to restrict ourselves to simpler moves that might be less time-consuming and labor-intensive. In the model, this would correspond to a set of -transitions into a copy of the original machine with the same states but fewer transitions. Dancing is rarely done without music, and swing is no exception. A large part of “getting good” at swing is developing musicality—a sense of how the music should effect your choice of moves. If we want to express musicality in our automata model, one place to start might be representing the music as an automaton as well. This simple automaton counts out the four beats in a measure of swing music. Let’s say we want to enforce that an 8-count move should always start at the beginning of a measure. This won’t always happen, since a 6-count moves often end mid-measure, but it usually feels better. One way we could do this would be to simulate both automata simultaneously. Each time we do a 6-count move, we advance the music automaton 6 steps, and each time we do a 8-count move, advance it 8 steps. Now, we can make sure that 8-count moves start at the beginning of a measure by making sure that the music automaton is in state 1 before we do an 8-count move. I haven’t quite worked out a formal way of doing this yet, but I’m sure there’s a clean way to work the music into the model. I am fully aware that I made a ton of simplifications when talking about dancing. There’s a lot more to swing than strings of moves, and even if you do ignore all of the human and musical aspects, it is still way more complex than I made it out to be. My point wasn’t to fully capture all of swing dance in one computer science formalism—I just wanted to explore the space and see if I could learn something. Dancing is fun2, and computer science is fun3. Putting them together is a natural way for me to explore each in a little bit more depth, and in this case, I think I got something pretty cool out of it.